Worms escape from the worm farm! value a home and dry place when a cold front is just hitting our town and tend to seek cover wherever we can to avoid getting wet our worms often leave their worm bins and bulk beds to crawl up the walls of houses, along the sidewalks, fall into swimming pools or new places around the garden. Many times we've seen hundred's of worms stranded on the pavement or the street once the morning sun hit the grounds and dried them up. It takes just a few minutes for a worm to die once exposed to the sunlight with no place to hide. 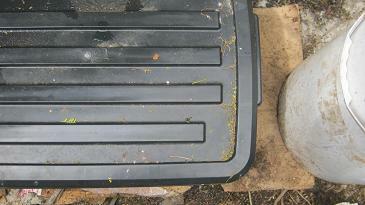 So it happens quite frequently that a once thriving worm bin loses lots of worms due to heavy rains. 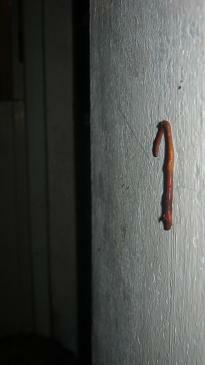 A compost worm hanging on a wall 1 meter above the ground. 1) Worms escape in wet weather because they can drown if their burrows or worm bins get flooded with water that has low oxygen content. However this shouldn't be a problem for earthworms in properly constructed worm bins or bulk beds as they are covered and only little to no rainwater will enter their home. 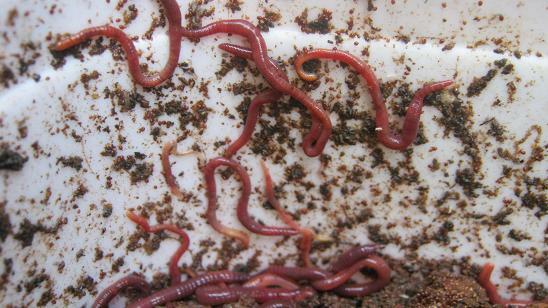 2) Some worm farmers believe that the worms escape in wet weather because they can notice the wet conditions outside their living space and want to use them to move to greener pastures to find new breeding mates. This might be especially be true if a worm bin has a high population and the worms might feel crowded. 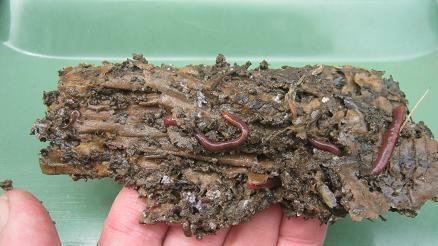 Many well designed worm farms will protect worms against rain. 3) The last possible reason for the migration of worms from a worm farm is their dislike of vibrations that are caused by the raindrops falling and banging onto the lids and sides of their Worm bins. These vibrations might similar to those made by a mole digging through the soil. The mole is the fiercest predator of earthworms and people imitate the noise that a digging Mole makes to catch earthworms. 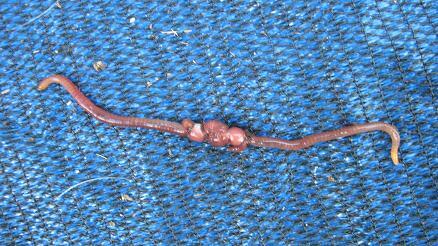 This practice is called worm grunting, worm fiddling or worm charming and is quite popular in the United States. The theory that worms dislike the rain drops banging on their worm farms is supported by the fact that worm bins that are standing in sheltered places like a garden shed or a garage, are losing significantly fewer worms than those that are placed outside. But knowing that many keen worm bin owners don't have the luxury of a Garage or Garden shed, what are the options when worms escape out of worm farms in wet weather? How are we going to protect our worms from the sun that could potentially kill them the next day? 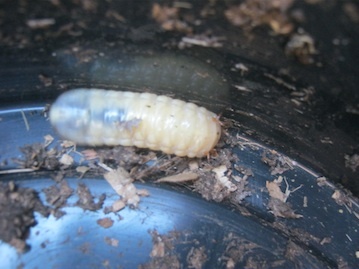 A sheet of corrugated cardboard under a worm farm acts as a worm shelter. 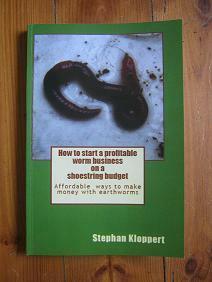 We found a cheap and effective way of minimizing the loss of worms. When we expect rain to hit our town we set up what we call "Worm shelters"! It sounds fancy but they are actually easy to make and more importantly effective. What you will need are some old newspapers or cardboard boxes. All you have to do is to place an old newspaper (several sheets at once) or a nice flat piece of corrugated cardboard (the bigger the better) on the ground underneath your worm bins or as close as possible. We use corrugated cardboard as it works perfectly. The cardboard sheets will soak up water during the rainstorm and will offer the worms that leave their bins during a rainy night a place of food and shelter once the sun comes up the next morning. All you have to do now after a heavy downpour is to lift up the Cardboard or Newspaper, pick up the worms and return them to the worm bin. If the wet weather continues for a while just leave the worm shelters outside. Just make sure to pick the worms and worm shelters up before the cardboard or the newspaper dries out. This piece of cardboard protected a bunch of worms for several weeks. 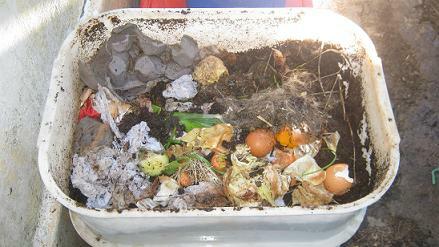 You can use a soft hand broom and a dustpan to sweep them up or take the whole sheet of cardboard and throw it into your worm bin. The worms will love it. 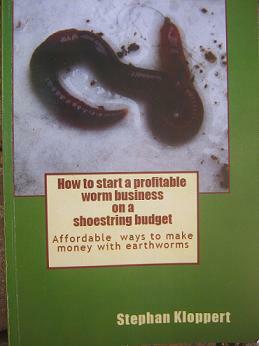 The method works so well that you can literally save hundreds of worms with it. Just a few weeks ago we picked up a big cardboard piece about that was placed next to some worm farms for a couple of weeks and we found 987 worms in it happy and alive. The morning after a heavy rain shower go outside and have a look around. Pick up a few bricks or buckets that might have some moisture preserved underneath their bottom. might harbor some stranded worms. 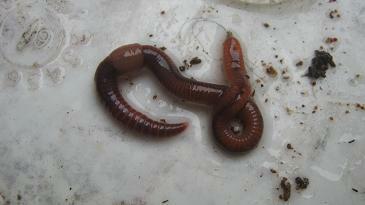 You will be surprised how many worms you will find underneath your worm shelters in the morning after a heavy downpour. So before your worms escape next time from your worm farm set up a worm shelter to protect your worms and reduce your losses. Return from "worms escape" to the "Home Page"
For any questions or suggestions please go to our contact form!